Roy Kring of the Bedford Minutemen was nabbed by British soldier after climbing the pole. Roy Kring was ready to defy the British Redcoats - again. Dressed in Colonial garb, he put down his snare drum Saturday, shimmied up the 22-foot wooden pole, and placed a knitted red cap - bearing “Liberty’’ embroidered in white yarn - on top, just as he had done in 2005. 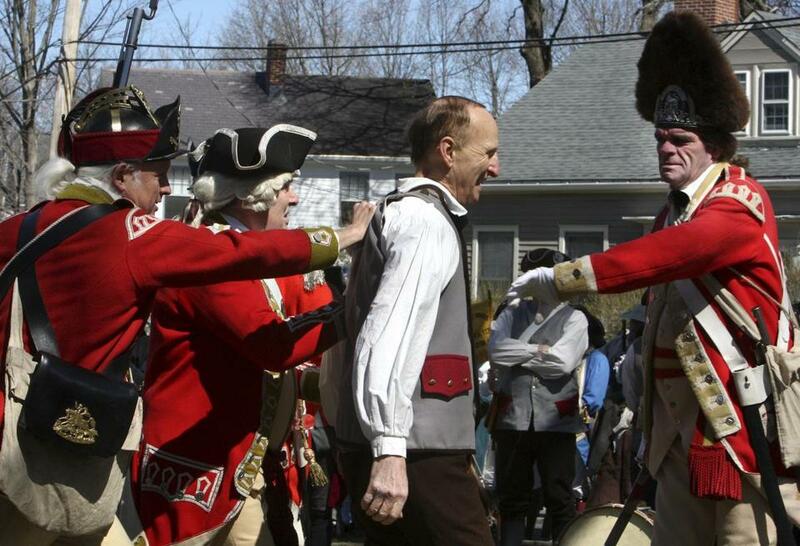 For the past 47 years, Kring and his fellow Bedford Minutemen have preluded Patriots Day by marching a quarter-mile through town and capping a pole in Wilson Park with a red hat, a traditional Colonial symbol of protest against British rule. Redcoats, who promptly “arrested’’ him and hauled him off. But the hat - a historic symbol of liberty known as a Phrygian cap - will remain on the pole for the entire year. 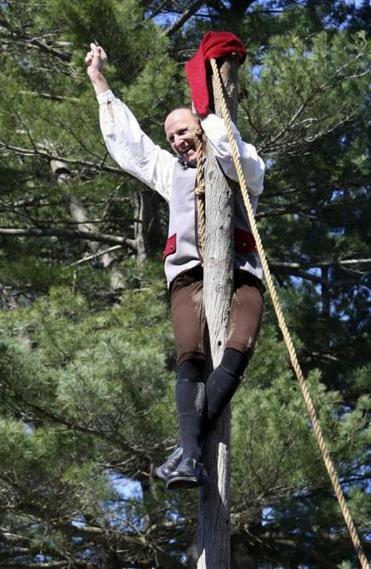 Cathy Cordes, chairwoman of the Board of Selectmen, said the event draws Minutemen companies to Bedford from surrounding towns a week before Patriots Day, making the pole-capping a warm-up celebration for the region. The Phrygian cap, which resembles an oversized, slouching red beanie, is a symbol of freedom dating back to the ancient Greeks, whose slaves, when emancipated, donned the caps to prove their status as free men. The hats were revived repeatedly throughout history, especially during the Revolutionary War, as an emblem of protest against oppression. As he marched through the town, a band of drummers and fifers behind him, Hacala followed the footsteps of Captain Jonathan Wilson, the Revolutionary War leader of the Bedford Minutemen whose eponymous park is home to the ceremonial liberty pole. Wilson was one of the first to fall at the Battle of Lexington, one of the skirmishes that sparked the war. But even as he led his militia this year, he said nothing could top his first year marching in its ranks, just four days after the terrorist attacks on Sept. 11, 2001. Alexander C. Kaufman can be reached at akaufman@globe .com. Follow him on Twitter @AlexCKaufman.